As the first British woman convert to Islam on record as making the pilgrimage to Mecca and visiting Medina, Lady Evelyn Cobbold (1867- 1963) cuts a unique figure in the annals of the Muslim Hajj. Anglo-Scottish aristocrat and landowner, Evelyn Murray had spent childhood winters in North Africa.There she had been imbued with the Muslim way of life, becoming, as she puts it, a little Muslim at heart. While travelling widely as an adult in the Arab world, she also maintained a conventional place in society at home, marrying the wealthy John Cobbold in 1891 and devoting herself to her Suffolk and London houses and her Scottish estate, where she became a renowned deer-stalker. Deciding to perform the pilgrimage in 1933, at the age of 66, she stayed with the Philbys in Jeddah while awaiting permission to go to Mecca, and received visits from various dignitaries, notably the King's son the Amir Faysal (later King Faysal). Pilgrimage to Mecca is as much an account of an interior journey of faith as a conventional travelogue. It takes the form of a day-by-day journal interspersed with digressions on the history and merits of Islam. 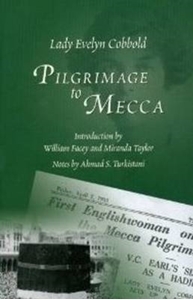 She is the first English writer to give a first-hand description of the life of the women's quarters of the households in which she stayed in Medina, Mecca and Muna - an account remarkable for its sympathy and vividness. Her book was first published in 1934 but has never until now been reprinted. This new edition, with a substantial biographical introduction by William Facey and Miranda Taylor (a great-great-niece of Lady Evelyn), serves to rescue this unique and intriguing Anglo-Muslim from the obscurity that has since befallen her.